Iraq will hold a general election on 30 January next year, officials say. It will be the second time that Iraqis vote for a national parliament since the US-led invasion six years ago. 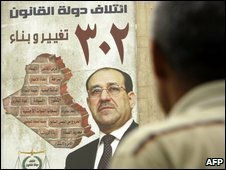 Correspondents say the election will be a key test for Prime Minister Nouri al-Maliki, whose allies made big gains in local elections earlier this year. The last parliamentary vote in December 2005 was largely boycotted by Sunni Arabs, resulting in an easy victory for Shia parties and Kurdish groups. The office of Iraq's first deputy parliamentary speaker said the date was proposed by the country's federal court and must now be agreed by parliament, Reuters news agency reports. The decision to hold the election comes after allies of Prime Minister Maliki, under the State of Law Coalition banner, won a resounding victory in the 31 January provincial vote, giving the premier a popular mandate.